The North American leap from a culture of healthy death acceptance to a culture of death denial has been no leap at all. It’s been a journey of small steps. And this journey has, in part, been enabled by both the professionalization of death and the funeral industry. 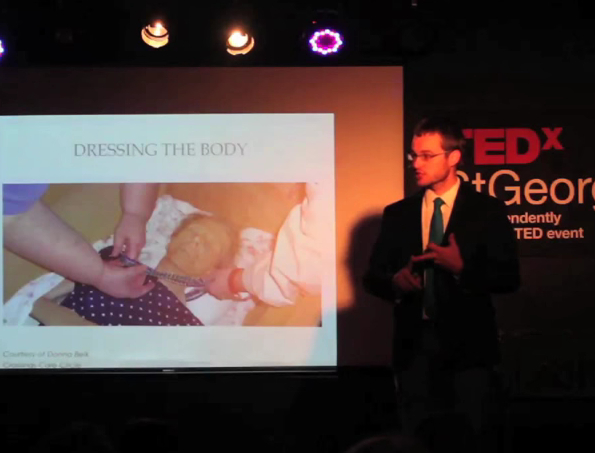 In this talk, I explore options that help us pursue death acceptance by taking back death care responsibilities. But that won’t happen. Unless you become a vampire. Two. Find a green cemetery. Most cemeteries require a vault. Vaults hold both a practical value (they keep the ground from sinking when the body/coffin decompose) and a psychological value (they keep things away from the body). Vaults generally cost anywhere from $700 on up. Most cemeteries charge for opening of the grave and closing of the grave. That too generally costs $500 on up. But if you’re okay with the ground sinking over a grave and don’t mind the elements touching the deceased, then you can consider doing away with the vault. Green cemeteries usually forbid vaults and many allow you to open and close the grave yourself, saving you anywhere from $1,200 or more. Unfortunately, there’s only 93 green cemeteries in the United States. Although they are rare, there are traditional cemeteries that DON’T require a vault. There’s two in a thirty mile radius of our funeral home. But, they’ll still charge you for opening and closing of the grave. But remember, vaults act as prisons to would be zombies. So, if you’re a firm believer in the zombie apocalypse, it may be worth spending the extra cash in order to save humanity. You should be able find a funeral home that will perform what we call a “direct cremation” for around or under $2,000. A “direct cremation” is usually defined as just a cremation with no funeral service. You can have the funeral service on your own without the help of a funeral home and it will save you some cash. If you want embalming, and you want a public viewing and you want to save money, try having a viewing and then get cremated. Usually, cremation costs less than having to buy a vault and paying for the opening and closing of the grave. And most funeral homes have some sort of inexpensive options for caskets. If you choose this option, can might be able to save upwards of $2,000. Flowers. Belly dancers. Elton John personally performing, “The Circle of Life”. All extras. Don’t need ‘em. Why do we buy such beautiful pieces of casket work and then promptly bury them? Confusing. Spend that money on something worthwhile like Netflix or pizza. For the most part, you don’t need embalming if you chose a direct burial. If you want a service, you can have a graveside service. You could possibly save a couple hundred to nearly a $1000 if you choose a direct burial. Home funerals are still on the fringe of public consciousness regarding death care; but, they need to be on the forefront. In most states, YOUR FAMILY CAN PERFORM THE ENTIRE FUNERAL ON THEIR OWN. No embalming needed. No funeral director needed. If you have a home funeral and a green burial, you’re talking about saving a whole lot of money. I’m a huge supporter of home funerals not only for financial reasons, but mainly because I think it’s healthier for families to practice death care on their own. If you want to choose the home funeral option, you need to start thinking about it now. It’s probably not something you can pull off last minute (I’ll be writing more about this in the future). The Amish hire a funeral director to embalm the body and perform the legal paperwork, and then the Amish do the rest. They dress the body, casket the body, have a home viewing and perform the logistical work of the funeral. This option will probably save you a couple grand, but – like the home funeral option – it’s something that you’d have to prepare for before the actual dying happens. This isn’t something you can just do. You have to pay some time in research. First, NOT ALL BODIES ARE ACCEPTED BY SCIENCE. Yes, unlike Jesus, Science doesn’t love everyone. Secondly, find a program in your area. Start off by searching, “willed body program” and your city or state. And then go from there. You may still have to pay some money for transportation, etc., but it should be very minimal. If you are accepted by Science, you should make yourself a t-shirt that says, “Science loves me for my body.” Because you deserve that t-shirt. PREFACE: These predictions are simply conclusions based on fringe ideas I see being developed today. These “predictions” aren’t necessarily my “preferences”. By 2024, embalming will no longer be the majority choice, while cremation and alternate burial options (green burials, etc) will not only count for the majority of dispositions, but will continue to rise in popularity. Pet burials and maybe even pet funerals will continue to gain momentum. In 2008, the cremation rate for England was at 72.4%. In 2034, America will have reached the same rate. The remaining 17.6% will probably be either direct burial (with no embalming) or some other type of sustainable full burial option. Embalming will only be performed on those who suffered tragic deaths; or on bodies that need some type of shipment. It wouldn’t surprise me if Alkaline Hydrolysis (or something similar) has a major foothold in the disposition of the deceased. It’s possible that Alkaline Hydrolysis takes over cremation due to the fact that it’s a more sustainable option. With the ability for a death date to be determined via euthanasia, it’s possible that a person’s life is celebrated through ritual BEFORE their death, instead of after it. This changes the whole landscape for the funeral industry. Throughout the next 60 years, end-of-life discussions be a hot topic. Whether it be insurance concerns, euthanasia ethics or various other topics that arise, we will all have an opinion. In 2075 the conversation starts to shift, as people begin living very long and healthy lives through advanced technology, medicine and various synthetic forms of longevity aid. It’s possible that death becomes a welcome friend, instead of a hated foe … that when people reach the age of 150 they simply want to die. It’s possible that we will be able to sustain life much farther than we sustain health. It’s possible, at this point, the euthanasia become the dominate cause of death. Instead of funeral homes, there’s now “Celebration Centers”. At this point, technology allows us to be anything we want to be. And we’ll all choose to be Batman … the rich kid who has all of his needs fulfilled so he decides to test his fate by pushing limits. And we’ll all die stupid narcissistic heroic deaths from rock climbing or space explorations or deep sea diving. At this point, humanity will kill itself off via stupidity and dogs will rule the world. You heard it here first: Planet of the Dogs starts in 100 years. It’s always a fitting time to consider what kind of environmental destruction I’ll leave in my wake once I depart. Others, I’m afraid to say, are more concerned with their environmental footprint – or body print – than I am. For them, there’s a veritable cornucopia of options for final remains, aside from traditional cemetery burial. Some of the natural and green burial movements aren’t a major departure from tradition, but these options do seek to reduce the human impact after death. 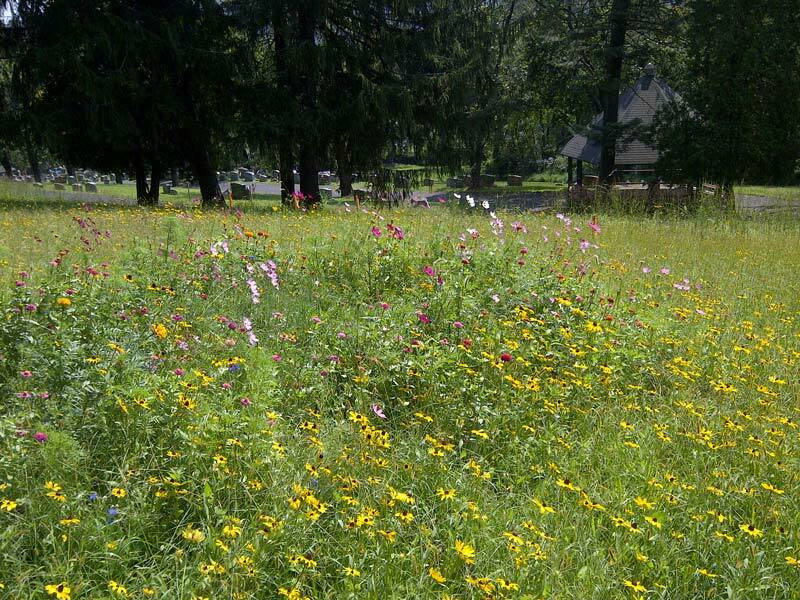 Cemeteries are gradually opening up spaces dedicated to environmentalists – some go so far as to offer wildflower meadows devoid of headstones and markers. These options further reduce environmental impact by eliminating all the mowing of grass and weed-whacking that makes use of fossil fuels. It’s one of the less-extreme measures that’s taking root on the American burial scene. More-extreme to me is this mushroom death suit I’ve been reading about. According to the Infinity Project, studies and tests are underway to develop the perfect mushroom that would “consume” what’s left of a person. A prototype of the suit isn’t too pretty, the one I saw was black in color and looked like something you’d wear on a deep ocean dive (see below). But it’s supposedly filled with mushroom spores which, once I started going sour, would consume all that’s left of me including all the mercury I’ve collected from eating fish I caught. I’ll have to assume these mushrooms are not edible. I hope they place a sign or something near them so people who pick berries and wild fruit don’t accidentally make soup out of them. I’m unsure if there’s a quiet disagreement underway between the green burial clan and the cremation club. Cremation doesn’t leave much but ash – yet it requires combustion and ultimately puts ‘people smoke’ up into the air. I’m not going to look it up. I’m sure somebody out there has detailed all the byproducts of people combustion. For those willing to accept a little smokestack pollution, there’s a big list of otherwise nature-friendly options for final remains. Scattering is one of the more-senior of these options. Mariners are providing the service, offering people a chance to have their remains scattered into the ocean. That’s a viable option for those who love the sea. 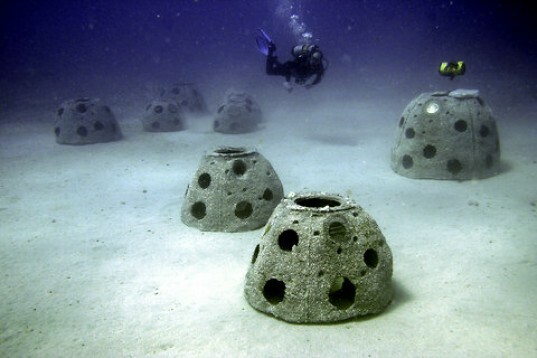 So too is the idea of incorporating a person’s cremated remains into an appropriate shape for a reef – offering tiny sea creatures a new home with a human touch. In terms of reducing the impact my dirty remains will have on the Earth, being cremated then sent into outer space seems like an option worth looking into. There’s a company that will send a “symbolic portion” of cremains out into space on a commercial flight that’s heading up anyway to bring a satellite into orbit. The company, Celstis, boasts responsibility for the first human burial on the moon back in 1999. I’m not sure if I’m happy about this idea. I haven’t decided yet if I want to create an environmental movement dedicated to the moon, plus I’m still thinking about pitching a new idea to situate a landfill up there, so I’m a bit conflicted. It might be a stretch to get tradition-minded people to consider having their remains cast off the planet, but that doesn’t make these people anti-environment either. 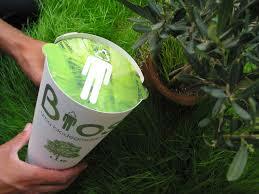 The next best thing for the terrestrial environmental burial also involves cremation ashes – placed into the Bio Urn. These types of final resting places entail putting people’s ashes into a biodegradable cup filled with a seed so that the deceased will be engrained into a tree that grows and reaches towards the sky. Trees produce oxygen too, so it’s a way of giving back some of the air we selfish humans think nothing of breathing in all the time. It seems to me new methods of dealing with our final remains just keep surfacing, which is a great thing in terms of giving people options. It’s even better for me – I consider myself among the most selfish people on my planet. It’s no secret people are opting for cremation at increasing rates, reducing what’s left of themselves to a bucketful of ash. Whether these remains are stored in a columbarium or scattered over the desert, ocean, or tossed on a shelf, they are taking up much less space than we, as a people, used to in the old days. Picking up candy bar wrappers when I’m out in the woods hunting probably doesn’t get me into the environmentalist club. Nor does keeping the heat on at 70-degrees in my house when it’s chilly. And I need four-wheel-drive, living in Upstate New York, which requires a bit more fuel. I mow my lawn with a gas-powered mower and have no problem letting machinery do the work when there is a machine to do it. I consider that an expression of my pride in the accomplishments of industrious, inventive people. For a stodgy and uninteresting person like myself, all these new-age and environmentally-friendly burial methods are a source of happiness. But that’s not because I have any intention of taking advantage of them. I tried to envision myself as a coral reef but can’t get the thought of my old fish tank – and what the fish did to the pretend reefs I put on the bottom – out of my head. I am equally uninterested in having a bunch of fungi feed off of my hide. Ultimately, I plan to get the whole nine yards of a funeral just like my grandfather and his grandfather and the rest of my family. I’ll be taking up a slew of space underground and bringing all my chemicals with me, along with my stamp collection. So the continued movement towards Earth-friendly final remains disposition is a good thing for me. It means it’s less-likely I’ll be told there’s no room for me in the cemetery. A photo of Green Meadow in late summer. There are only a few green cemeteries in the Eastern part of Pennsylvania, none of which are close to my funeral home’s location. Based solely on the information on their website, I decided to visit “Green Meadow” Cemetery some two hours away in Lehigh Valley. I called the “contact” number and soon heard a woman’s pleasant voice on the other end. “Hello”, she said cheerfully. As much as I was pleased to find such cheerfulness, I was also somewhat confused as I expected her to say, “Hello. Green Meadow Cemetery.” It seemed as though I had called someone’s home telephone number. I started, “Hi. My name is Caleb. Is Ed available?” “One minute”, she replied. Ed – the name attached to the website’s contact number — grabbed the phone and we chatted for 15 minutes about Green Meadow and the philosophy behind it. I explained that I was writing a small paper on green cemeteries for my post-grad class and we set a date for me to come up to Green Meadow and take a tour. I arrived on time to find Ed already waiting. He was a young man in his seventies. I say “young” because it seemed Green Meadow was an inspiration for him that brought out the energy of youth. He explained that twelve years ago the Fountain Hill Cemetery (founded in 1872) had exhausted its perpetual care funding and – like many cemeteries – was on the brink of death. The cemetery was unassociated with a church or organization and was simply a non-profit with no owner or director. Ed and a few others took it upon themselves to revive the dying cemetery and after 12 years of volunteer work the cemetery was just starting to stand on its own. Part of the revival of the old cemetery has been the inclusion of Green Meadow, which sits within the boundaries of Fountain Hill Cemetery on a half-acre of wildflowers, grasses and shrubs. Through a mutual friend, Ed was introduced to Mark Harris, the author of a Green Burial standard entitled “Grave Matters: A Journey through the Modern Funeral Industry to a Way of Natural Burial.” After numerous conversations, Ed and the board at Fountain Hill partnered with Mark to create a philosophically sound green cemetery some four years ago. 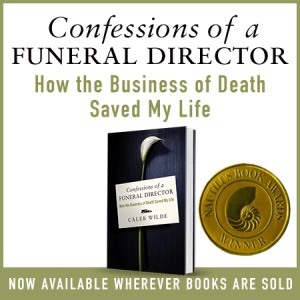 Ed said that “Mark remains the cemetery’s greatest proponent.” Mark writes in his book, “The modern funeral has become so entrenched, so routinized, in fact, that most families believe it’s all but required when death comes calling (Harris 2007; 47). Green Meadow cemetery calls into question the “all but required” traditional American funeral. On a larger front, the green burial movement is interrelated with the natural death movement, home funerals and the natural birth movement as it underscores the desire to move away from the Promethean attempts of industrialized science and technology (Verhey 2011; 32 – 33). Paula Hendrick, who surveyed the natural death movement in America notes that “our focus on personal autonomy and self-development have made it very hard for us to accept the inevitability of death” (Albery and Wienrich 2000; 11). Michael Ignatieff writing for “The New Republic” echoes Hendrick when he states, “’Cultures that live by the values of self-realisation and self-mastery are not especially good at dying, at submitting to those experiences where freedom ends and biological fate begins. Why should they be? Their strong side is Promethean ambition: the defiance and transcendence of fate, the material and social limit. Their weak side is submitting to the inevitable” (Albery and Wienrich 2000; 12). allow and even invite, the decay of one’s physical body … and return what remains to the very elements it sprang from, as directly and simply as possible. In their last, final act, the deceased … have taken care in death to give back to the earth some very small measure of the vast resources they drew from it in life, and in the process, perpetuate the cycles of nature, of growth and decay, of death and rebirth, that sustain all of us. (Harris 2007; 42). Mark’s ideas are the heart behind the little cemetery “Green Meadows”, a place where one can “degrade naturally and rejoin the elements, to use what’s left of a life to regenerate new life, to return dust to dust” (http://www.greenmeadowpa.org/about-us/). 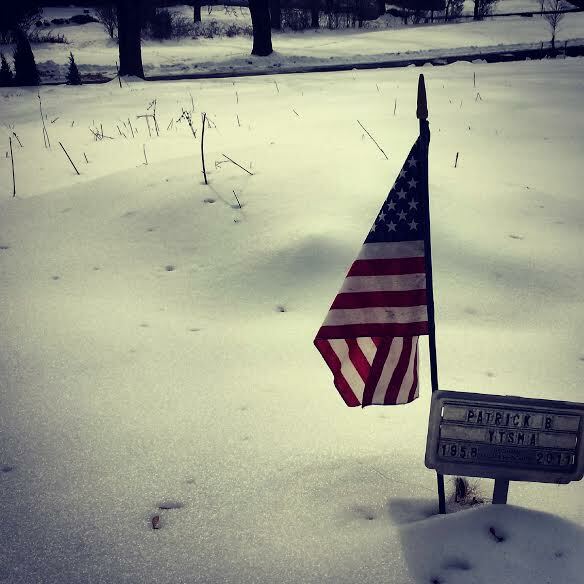 As Ed and I walked through the snow covered cemetery – stamped with the snow tracks of deer and birds — Ed pointed out the various graves. He noted that the first prominent burial in Green Meadow spurred some media attention. Patrick B. Ytsma, a well known local bicyclist, was struck and killed while riding his bicycle. His decision to be buried in Green Meadow inspired a newspaper article featuring the cemetery as well as the donation of labor and supplies for the erection of the cemetery’s sign. 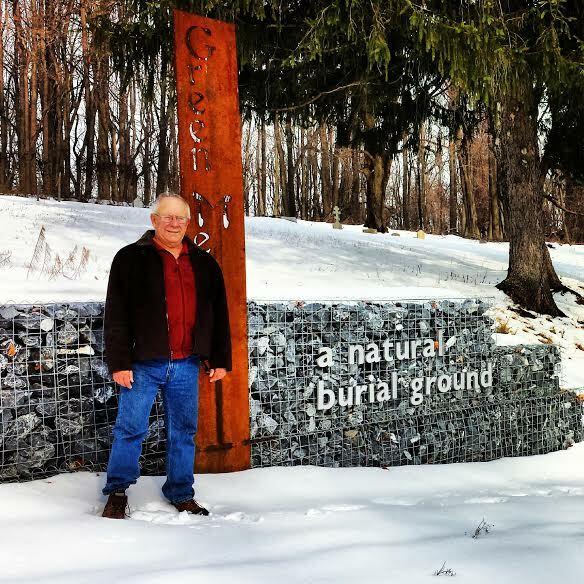 And yet despite Mark’s advocacy and the attention that Ytsma’s burial gained, the demand for green burial in the Lehigh Valley remains small with only an average of two burials per year. Ed – a generation ahead of his time – anticipates that the young generation that have been inspired by the larger green movement will slowly but surely begin to fill the beautiful little natural hillside that is Green Meadow. This, in many respects, is Ed’s heritage to the next generation and gift to a brighter, greener future.